Beyonce's cool demeanor throughout the brawl raised eyebrows, leaving conspiracists drunk in love off the most popular Queen B-related theories. Theory: Beyonce is an influential member of the Illuminati. Evidence: A hand gesture and the fact that Beyonce is, like, super famous. In 1776, a group of German men formed a secret society to ensure that Kelly Rowland would never shine brightest in Destiny's Child. You can thank that same tight-lipped dude-fest for the "Single Ladies" dance. But really, a group of Bavarian men founded the Illuminati on May 1, 1776, with the goals of abolishing religious influences in the public sector and supporting gender equality, among other things that have little to do with the current perception of the group. Bavarian ruler Charles Theodore permanently dissolved the Illuminati in 1785, but the group is still regularly name-checked by theorists who believe a revival of the secret society has been responsible for everything from Waterloo to Beyonce's Super Bowl XLVII performance. Beyonce's supposed link to the group is backed by a frequent use of a triangle hand gesture. The triangle — and its all-seeing eye — is a commonly cited symbol of Illuminati believers, but also happens to be a sign that Jay Z used to promote his record label, Roc-A-Fella Records. So if Beyonce really is orchestrating world events from a secret cave made from discarded weaves and fierceness, she's doing a terrible job of hiding it. Theory: Beyonce faked her pregnancy. Evidence: While sitting down for an interview with Australia television program Sunday Night, Beyonce's pregnant belly appeared to fold unnaturally. Beyonce revealed her heavily rumored bump to the world mid-performance at the 2011 MTV Video Music awards. Beyonce birthers claim a surrogate carried Blue Ivy, citing fold-gate and a "doth protest dat baby too much" approach to the controversy in her 2013 documentary Life Is But a Dream. Other people who never really inspected Bey's uterus are skeptical about her need for an entire hospital floor. What super-rich person would want to push a small human out of their body without the comfort of 20 hospital rooms? Gotta take advantage of those extra bed pans and basic cable options. Theory: Beyonce was born on Sept. 4, 1974, not Sept. 4, 1981. Evidence: She never had an awkward stage. 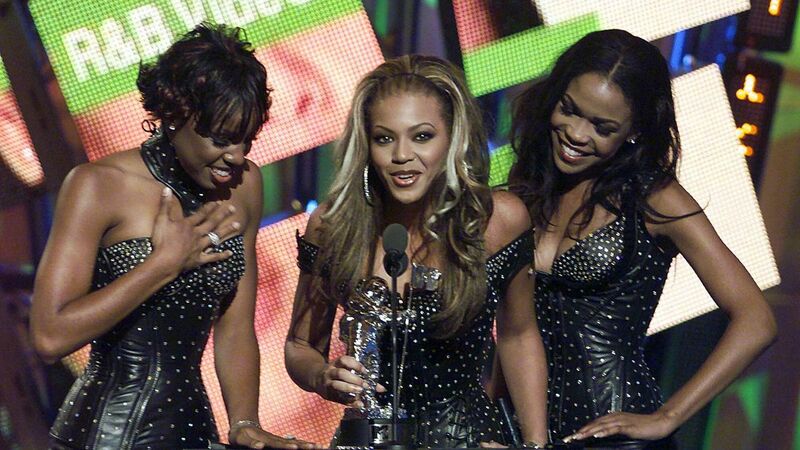 Beyonce (center), age 20, with her Destiny's Child bandmates in 2001. Beyonce's age has been questioned since her "Bootylicious" days in Destiny's Child. Rumors resurfaced in 2006, when an anonymous "tipster" who claimed to work for the Texas Department of Health allegedly found her birth record. Or maybe y'all just jealous. Theory: Beyonce is sister Solange's real mom. Evidence: Fuzzy math, an elevator brawl. Take Bey's questionable age theory and add a splash of teen pregnancy, and you have a conspiracy more complicated than season two of 16 and Pregnant. The theory goes that Beyonce's first pregnancy happened in 1986, making her Solange's mother, not sister. People who believe Beyonce is older than she claims say that her parents, Tina and Matthew Knowles, covered up the teenage pregnancy and raised Solange as their own. Plausible? Sure; we've all seen that episode of Maury. But Beyonce doesn't look 15 in this #ThrowbackThursday Instagram post of her with Solange. Theory: Beyonce is middle management at the Bank of Satan and recruiting teenagers for summer internships. Evidence: An end-of-days group called Now The End Begins released a video (on Vimeo; YouTube is the devil's work), laying out its evidence to back the theory that the devil recruited Beyonce and other celebrities to brainwash children through bumping beats and tongue wagging. People also accused Elvis of playing in Satan's band, but he was murdered by the Illuminati before the truth came out.